Rita’s career as a producer began in kindergarten, when she attempted to stage an inspired retelling of The Wizard of Oz. However, her career came to a sudden and tragic halt when Miss Binney rudely interrupted a major casting session, labeling it a major ‘class disruption’. 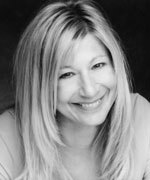 More recently, she has been producing extensively for television in the field of direct response for clients including Abbott Labs, Pfizer Pharmaceutical, Suzuki Motor Corp., Kraft Foods, Vermont Teddy Bear and J.G. Wentworth, to name a few. She has also produced many television spots and is honored to have had a hand in producing the documentary Lakota: Voices in the 21st Century. Rita’s early creative career began in Chicago as an Equity actress. She also enjoyed a year living in Singapore, working with the Singapore Symphony Orchestra as the guest narrator in performances of Peter and the Wolf and L’Histoire du Soldat at Victoria Hall. Rita is the proud owner of one Telly, and a loyal companion to one chubby applehead Siamese cat and one fabulously talented dog. She is still disrupting class every chance she gets.